Did you know that user accounts created in the vCenter SSO Server automatically expire by default after 365 days? If you do not update your password prior to the expiration date, in about a years time you could potentially be locked out of your vCenter SSO Server which also applies to the [email protected] account. 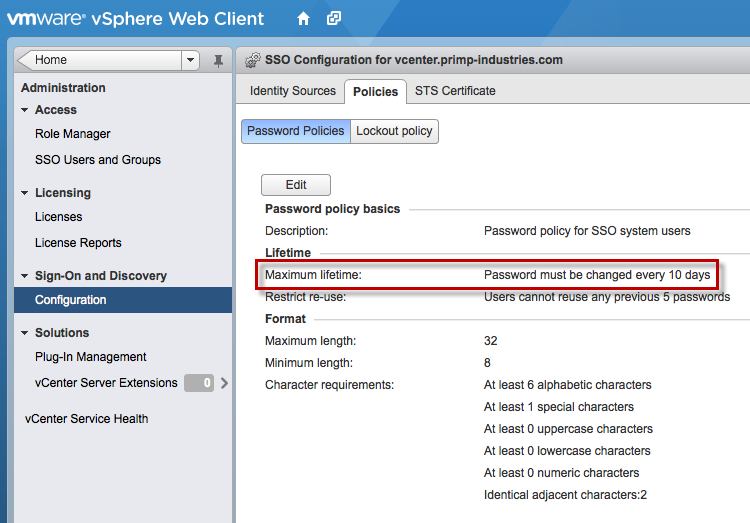 You can change the default password expiration policy by logging into the vSphere Web Client with an SSO Administrator account. Under the configuration section of "Sign-On and Discovery", there is a Password Policies tab that allows you can modify password policies. By default, this is set to 365 days. I would also recommend that after you have installed and setup your vCenter SSO Server, you add at least one user or group from your directory service such as Active Directory and assign it to the SSO Administrator group. This will ensure that you can still log in to the SSO configuration in the event the local SSO user accounts are locked out. Disclaimer: This "may" not be officially supported by VMware. Instead of having you manually dig around in the SSO Database, I have created a Perl script called getSSOUserExpiration.pl which can connect to either a MSSQL or vPostgress backend SSO database. The script which will automatically list out the current password policy as well as user accounts that will be expiring in N days, where N is input provided by the user. You also have the ability to configure the script to automatically email you the results which is nice for a daily or weekly report and can be setup using a cronjob or a scheduled task. There are several configuration variables that will need to be adjusted based on your environment and these are all located within the script itself. For more details on how to setup and use the script, please take a look at the Setup and Configuration section below. Note: To reduce any negative impact to the vCenter SSO Database, you should add or ask your DBA's to create a limited read-only account and limit access to the following tables above. You may even be able to have your DBA's create a scheduled routine for the specific queries and have that emailed to you internally. Note: The email body should contain the specific vCenter SSO Database, but I am not sure why it is not showing up in Gmail, but it does work for other email clients. 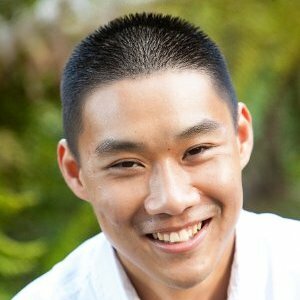 To connect to a vPostgres DB, you will need to install the following two perl packages: perl-DBI and perl-DBD-Pg. In this example, I am using the vMA appliance and the zypper package installer. For more details on how to add a SLES repo, please take a look at the following article. I also assume if you are connecting to a vPostgres DB, then you are using the VCSA (vCenter Server Appliance) and by default it does not accept remote connections. We will need to also make two configuration changes to the VCSA for our script to be able to connect to the database. Step 5 - Modify the getSSOUserExpiration.pl script and provide the credentials to your vCenter SSO DB. If you need help in identifying the vCenter SSO DB credentials, please refer to this article for the details. To connect to an MSSQL DB, there are a few additional steps and packages that will be required. We will be using FreeTDS which provides libraries to connect to an MSSQL DB for UNIX/Linux platforms. There was a bit of trial and error in getting the MSSQL solution working and I would like to thank Reuben Stump for his assistance. The following article was used as a reference for the setup below. In the example above, I named my database entry "sso" but you can use any name and this will be referenced when editing the script in step 5. Step 5 - Modify the getSSOUserExpiration.pl script and provide the credentials to your vCenter SSO DB. Did you test with VCSA 6.5 ?